Summary: This walk includes visits to two of the most popular sites in the Eden Valley and while both are remarkable structures of native stone they could not be more different. The first, Long Meg and her Daughters is one of the most important Bronze Age stone circles in the British Isles while the second, Lacy's Caves is an 18th century creation of man-made caves carved out of red sandstone on the bank of the River Eden. The small villages of Little Salkeld and Glassonby also feature on the route which enjoys views to the Eastern Lake District and North Pennines throughout the circuit. The Walk: I had travelled down from Scotland and arrived in Cumbria in the early afternoon and just as a violent storm hit the Lake District. Still I left the motorway at Penrith and drove along the A66 to Keswick and into Borrowdale in the hope the storm would pass so I could do my planned Castle Crag walk. No such luck, it rained and it poured. I watched the drenched walkers coming down from the mountains with glum faces and decided to turn tail. I drove back to Penrith, found my digs and checked in. At around 4.00pm I looked out from my room windows to see the rain had stopped. It was time for a local evening walk. (Note: I managed to complete my Castle Crag walk the following day). I had wanted to visit the Long Meg and her Daughters stone circle for a long time and with my Lake District walk scotched for the day this was the ideal opportunity to do so. I had five more hours of possible daylight and so I scanned the map and picked a route which would include the stone circle. What were Lacy's Caves though? I did not investigate further, leaving the find as a new discovery. 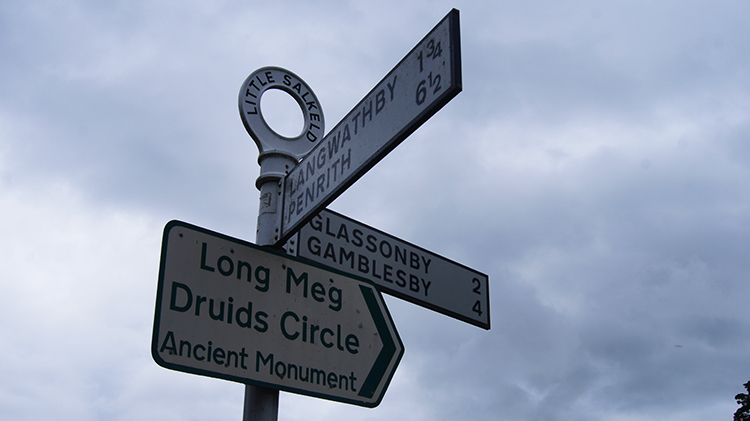 I arrived in Little Salkeld at 4.30pm and set off walking north along the roadside out of the village which a sign confirmed was the way to Long Meg Druids Circle and Ancient Monument. (I note the association with Druids is contested). There was no traffic on the road which I left beside a service reservoir to follow an unmade lane. Around one more corner I joined the access road to Long Meg and followed it eagerly. The storm which had hit hard earlier in the afternoon was departing the skies over the North Pennines as I looked south-east and across to Dufton. 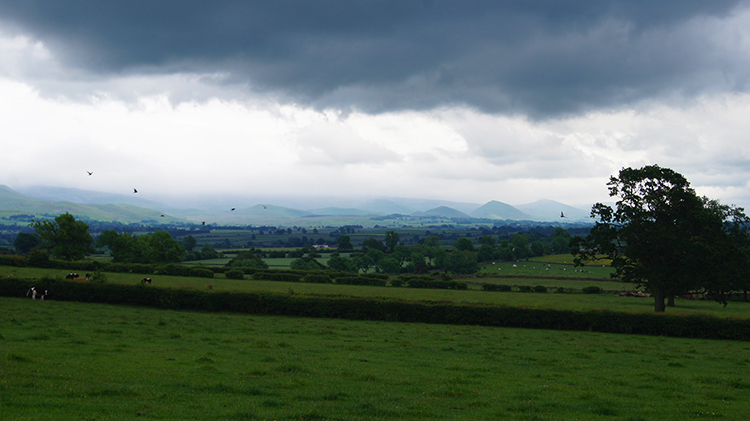 I easily spotted the recognisable pyramidal hills of Dufton Pike and Knock Pike with the last of the dark skies rushing over them. After just fifteen minutes of walking I arrived at the site of Long Meg and her Daughters. 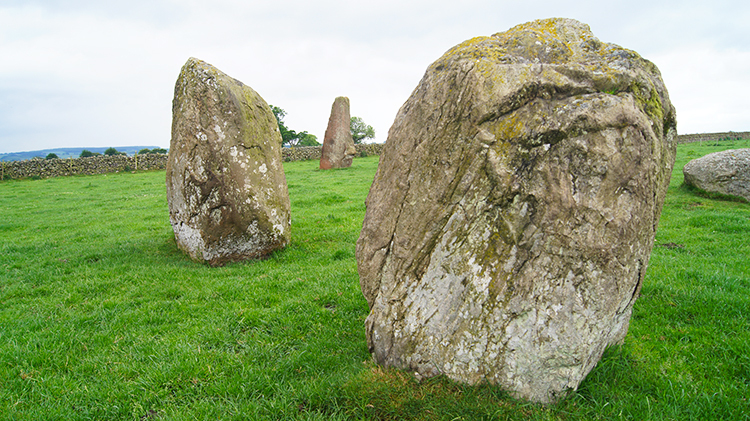 Long Meg herself was clear to make out, being more angular and upright while also the tallest of the stones in the circle and of a different colour to the rest. She is red sandstone while her daughters are all grey-white rhyolite glacial erratics. Some of the brood are more substantial and heavier stones than Long Meg though. Long Meg also stands outside the circle of daughters, keeping watch on the south side. I walked the perimeter of the circle to view it from all angles. I did not count all 68 daughters though. Then I walked to the centre of the sixth biggest stone circle in north-west Europe and took a full 360 degree look around. I enjoyed my time in the stone circle. Notwithstanding the original intention of the structure I admire the effort people made in those ancient days to move rocks that size and weight without the means of the modern day as immense. 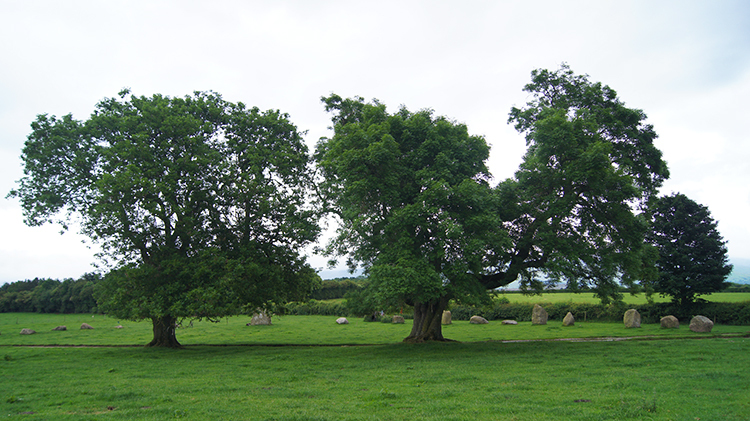 Before I took my leave of Long Meg and her Daughters I also admired the row of mature Oak Trees set within the stone circle. These impressive not so ancient giants complemented the stone circle in some way. I left Long Meg and followed the path north and along the edge of a small plantation leading to Little Meg. Rather than being a mini stone circle Little Meg is thought to be a bronze age assembly of stones which honour a chamber tomb. 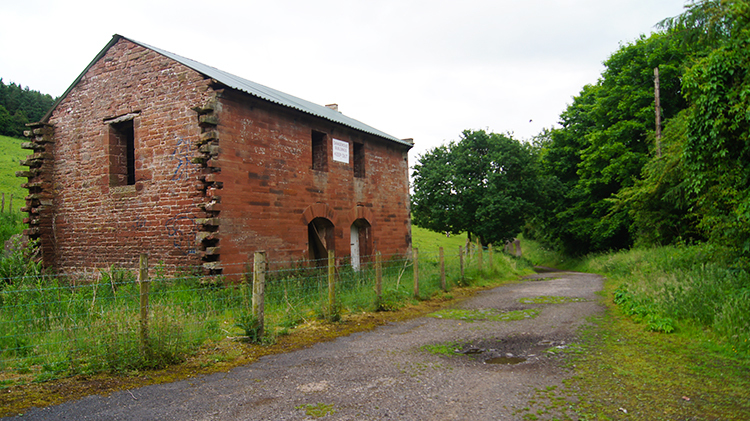 I paid my respects and continued on my way over a field and then along a quiet road to the village of Glassonby. I met one car while walking along the road before reaching the village. Glassonby was extremely quiet. 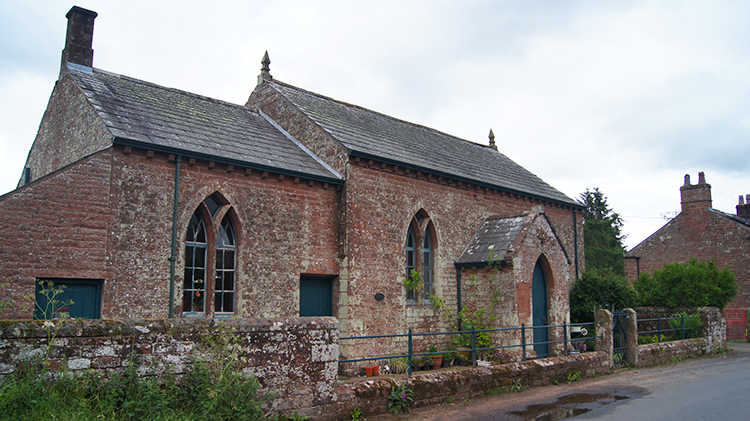 Just as Little Salkeld had been while I had arrived and parked up before setting off on my walk. I walked through the village pretty much unnoticed by anyone. This area of Cumbria was proving to be very quiet and laid back, perfect for a summers early evening stroll. I walked past the Old Chapel, now disused and destined to be a residential home and then down the inevitably quiet road in a north-west direction towards Daleraven Bridge. 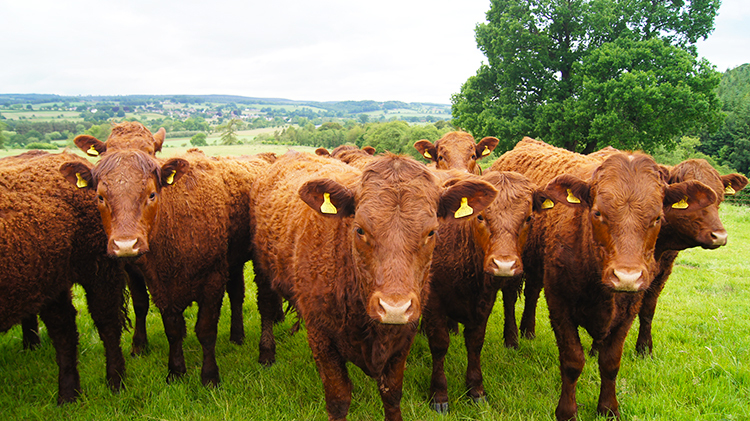 The only animation I saw was from a Stoat which scurried across the road about ten yards in front of me and then by a herd of Bullocks who walked across a field to greet me. They appeared quite friendly. All the same I was happy a fence separated us. 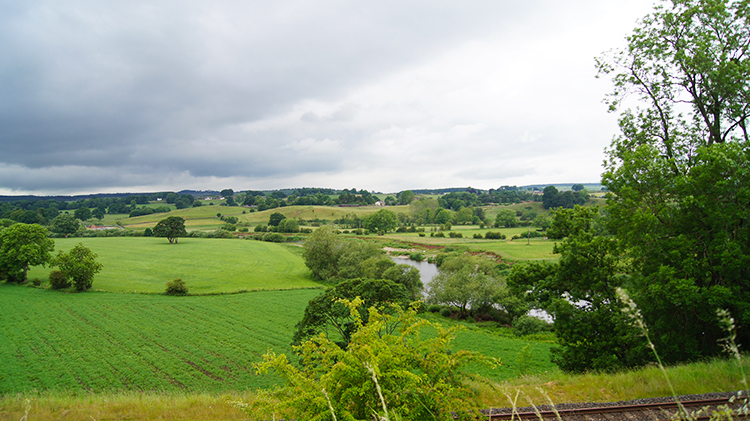 I arrived at Daleraven Bridge and left the highway liking Glassonby with the neighbouring village of Kirkoswald to start my walk following the course of the River Eden upstream. It was turning out to be quite a warm evening after the stormy afternoon and with the benign conditions came the midges. They were not as irritating as their Scottish cousins though and as I walked along the field side along the river I forget about them. Especially so when I came to points where the path had disappeared and fallen into the river. At one field boundary I had to swing myself around the last remaining field post to avoid climbing down into the collapse. It was fun. 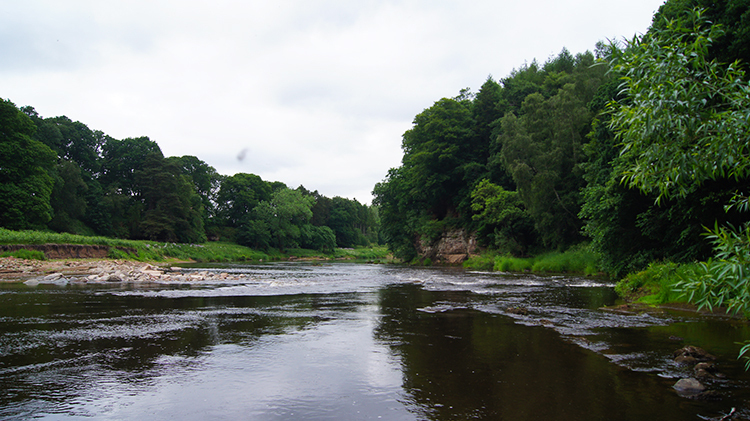 In general the walk along the river was lovely, the scene very beautiful with the calmed waters of the River Eden flowing peacefully and the closest riverside trees dipping their out-branches into the water. As I watched the water flow occasionally saw fish leap out to catch flies hovering above them. A fisherman would have done well. After a couple of fields and approximately 600 metres of walking I left the open and walked into the cover of woodland which was draped in the fresh green foliage of late spring and early summer. I love walking through woodland when everything seems fresh and new. The strong pungent smell of Wild Garlic filled the woodland, an intoxicating smell to me. The walk through the cover of trees was mostly along a good firm and well drained footpath though there was a good stretch in the middle which must have been wet underfoot as wooden boards were provided. Overall, the boarding worked and the way was well maintained. 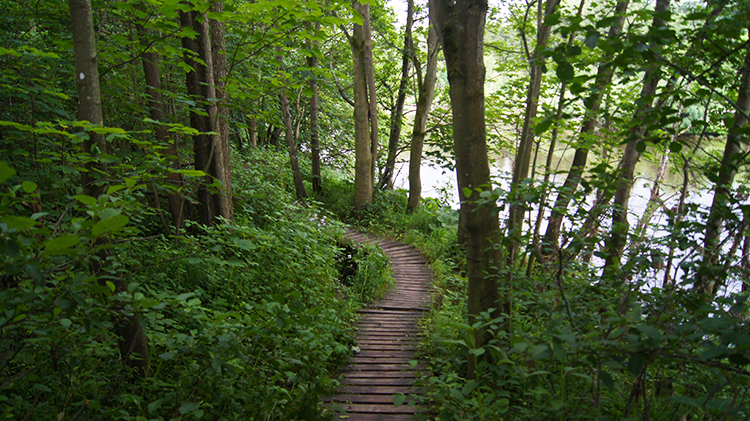 I never got my feet wet at all during my enjoyable woodland walk towards the mystery ahead of me. Lacy's Caves were an imminent discovery. All of a sudden the path which had been on the level and generously wide steepened to a short climb and narrowed to about one foot wide. 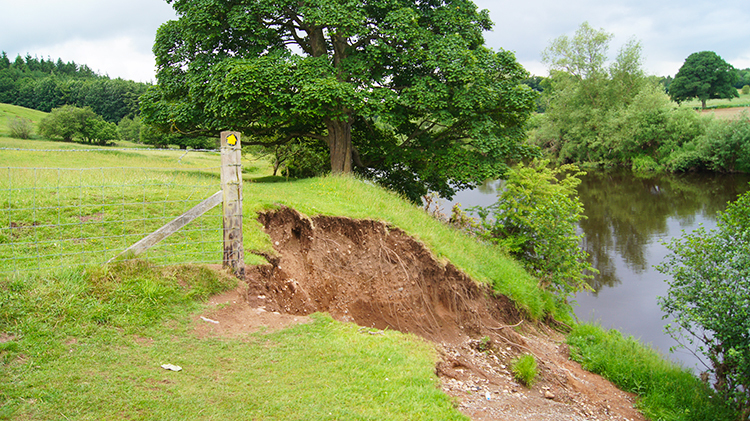 I was soon quite a height above the river which flowed precariously close to the edge of the path. I was pleased when it took a sharp turn left and away from the water. After a few more paces the path turned right and swept downhill. And then I came to a junction with the right side path bearing a sign set into a red sandstone cliff. It read Lacy's Caves. Dangerous path with sheep drops. please take care of young children. Proceed at your own risk. 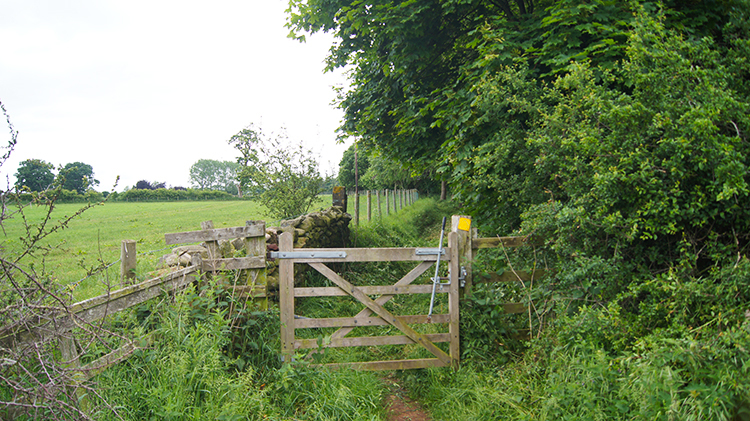 Path by permission of landowner. Camping, firelighting and swimming not allowed". I had in fact walked on top of Lacy's Caves in my approach from the north when I had made the steep climb on the path which circuited around to the junction. Now I could discover what they were. I followed the path cut through the cliff which provided a safe and fine entrance passageway. And then I turned a corner. 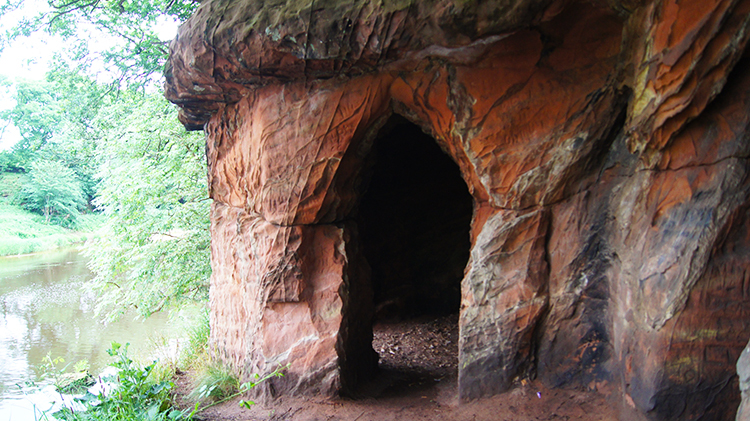 Lacy's Caves were cut high into a red sandstone cliff on the edge of the River Eden. The setting was stupendous. WOW WOW WOW. 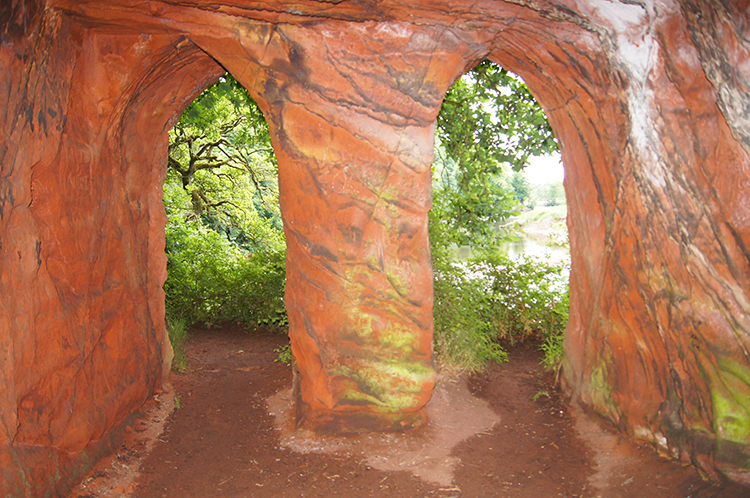 I looked at a fairy tale house with a fairy tale door cut out of brilliant red sandstone. It was absolutely gorgeous and inviting me in. An invitation I could not ignore. There were more doors leading to more chambers within and there were windows in some of the chambers too. There were wooden benches inviting me to sit and so I did to enjoy the atmosphere of this enchanting caves. 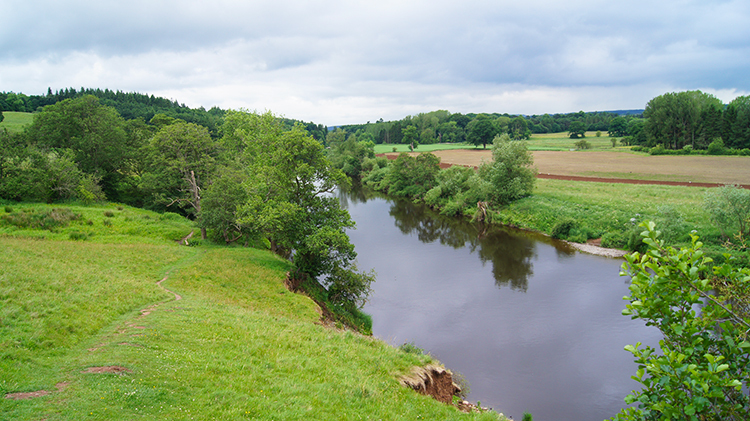 The views out across the River Eden were superb. I was utterly smitten. The carving out was brilliant work and some parts where lines of supplementary blackened stone created an artistic effect were captivating. Inevitably some of the rooms had internal walls covered in graffiti by visitors who wanted to leave their own mark. I declined knowing I could not improve on the original work. On my return to my accommodation in Penrith I read up the origin of Lacy's Caves. Thank you Lieutenant-Colonel Samuel Lacy of Salkeld Hall, who commissioned their carving in the 18th century. 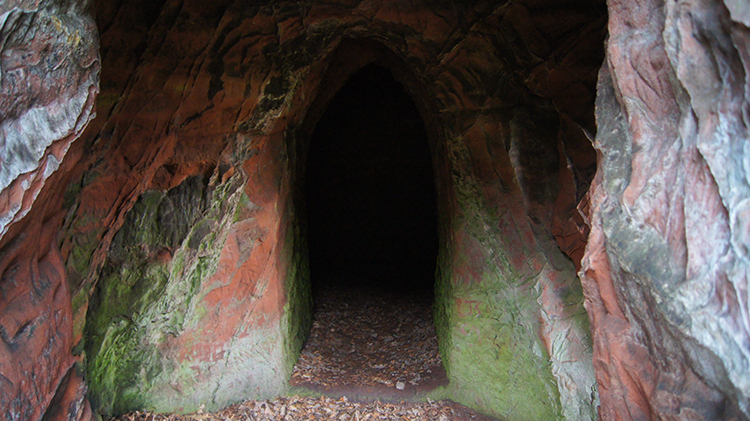 I would happily have used the caves as one of my overnight stops on my Great Britain walk if I had known about them and if they had been on the route. I left Lacy's Caves with a very warm feeling, having enjoyed some time in each of the five cells which comprise the caves. Sometimes walks bring huge bonuses. This walk just had. 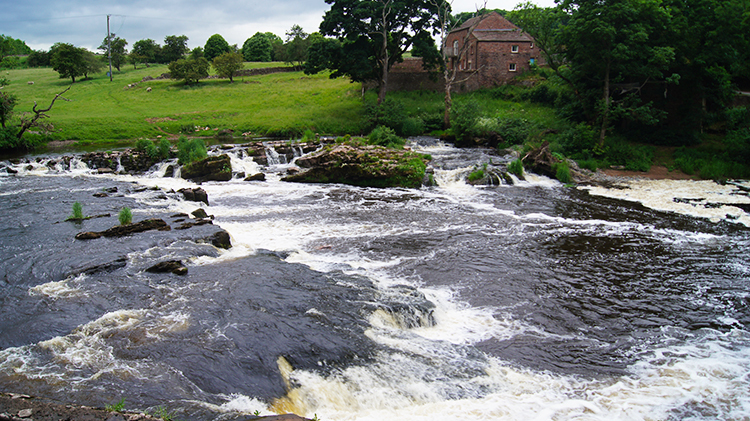 Soon on the resumption of the walk I dropped down to the River Eden near to the site of disused Force Mill, Eden Lacy and here I enjoyed some time beside the river. What had been a calm river further downstream where I had met it was now a noisy torrent as it cleared the mill weir and then hurtled in rapids over a set of stepped outcrops. I enjoyed watching over the angry waters before resuming on my walk through more woodland and near to the site of disused Longmeg Mine. The path took me past the outbuildings and past an electricity sub station before I reached the lane which would lead me back to Little Salkeld. It was 6.45pm when I passed the derelict building in picture. What two and a bit hours of fun I had enjoyed at first Long Meg and her Daughters and secondly at Lacy's Caves. 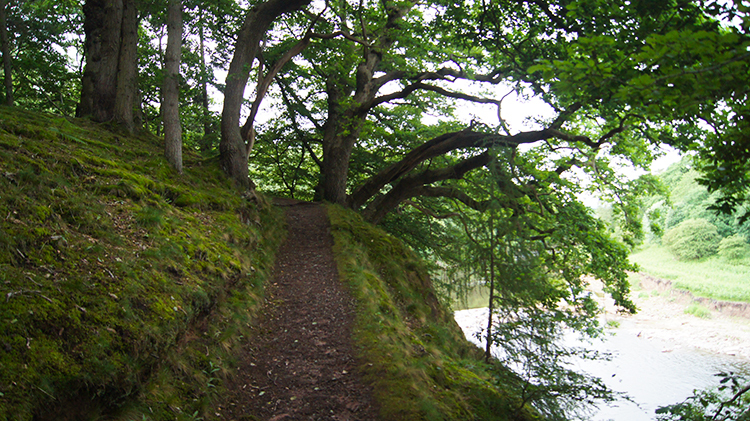 Not only that, the walk over fields and through woods beside the River Eden had too. As had the time down by the river. 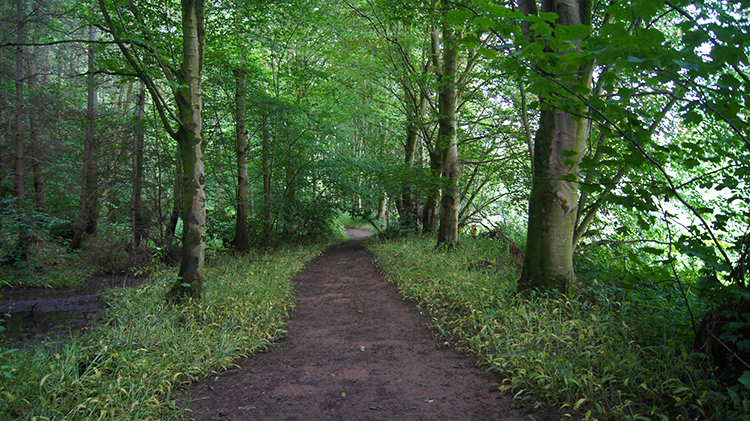 I walked along the long lane back to Little Salkeld in a very contented mood. As I looked over to the Eden Plain near Langwathby I thought how fortunate I had been to get this walk in as a bonus because of bad weather. 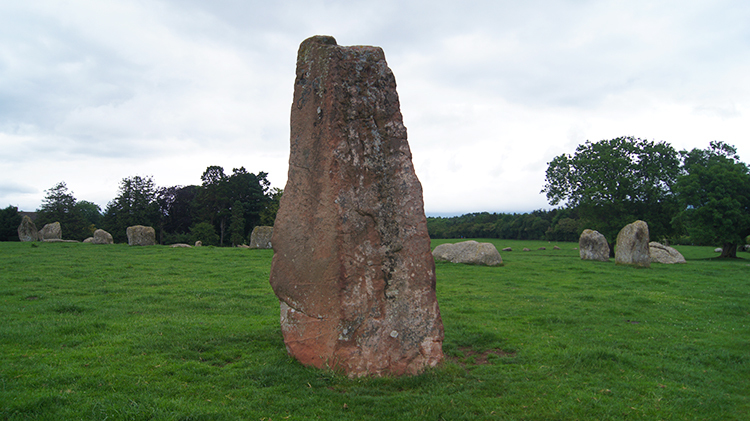 It was nice to see Long Meg and her Daughters at last. It was a fantastic to find Lacy's Caves and explore them. The walk was in fact brilliant all round.